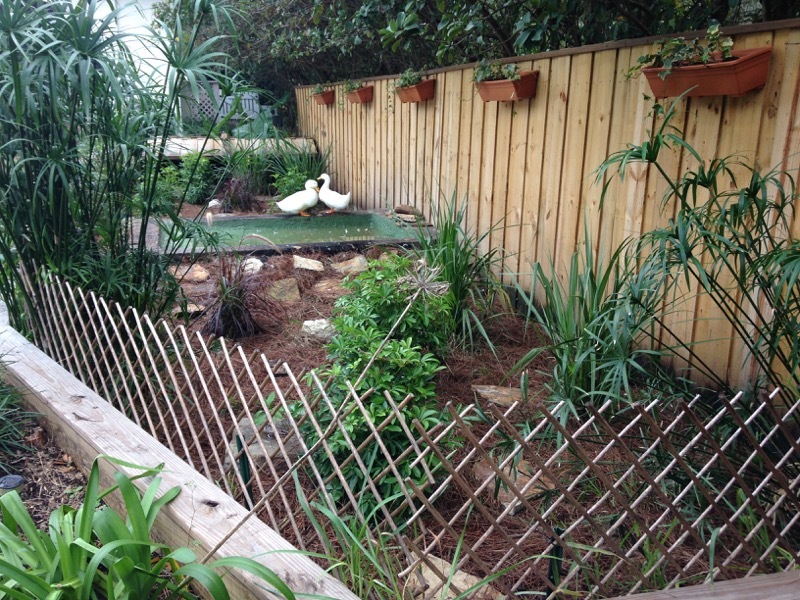 I've spent almost the entire year planning, designing, and repeatedly modifying the duck and tortoise area you see in the photo below. I worked with my wonderful neighbor Bevv (who did the initial design), my handyman Dan and my lawn expert Chris to build it all. Fence: The back portion is just a typical fence with a stained wooden 1" trim on the top, everything held up straight by 8ft 4x4s. The side and front edges are 4x4s piled on top of each other, with 6ft iron rods drilled straight down through them with concrete at the base. Then we piled up dirt on the outside and planted a variety of greens. Since the ducks kept jumping out and chased our small Chihuahuas around the whole yard, I added the wooden criss-crossed trellis around the front. A primary reason for making the fence solid is that it prevents the tortoise from trying to scale it. Enclosure: They all sleep in together in the wood enclosure built by Dan (towards the bottom left of the picture). The enclosure is heated by infrared bulbs on thermostat set to turn on at 70F. The enclosure has a front-flap that can be raised up with a simple pulley and hooked on the side to keep it open during the day. At night I just lower it. There is also a back flap that you can open up like the trunk of a typical sedan and we use that to fill up water/food. Also very useful when I want to hose out everything. There is a small mesh on one side of the enclosure to make sure it doesn't get too hot in the summer. If it gets too cold, I can put a small blanket on it to keep the warmth in. Pond: This was the most difficult thing to get right and I spent more time, money, and effort on it than anything else. Initially we had one of those pretty koi-style ponds with a big pump and filter as you can . I was prepared to deal with duck poop but I had no idea what the tortoise had in store for me. The tortoise ate grass all day and clogged the pump, filter, and pipes so bad we had to scrape the entire pond and rebuild. The pond you see now has a simple gravity drain. It is a large stagnant pond which gently slopes to the back. There is a 4" PVC pipe that drains everything out towards the back of the yard. There is a single heavy-duty valve that I can access without getting into the duck area which empties the pond within 30 seconds. I hose off any messes on the pond, close the valve, and refill. Takes about 10 minutes. The ducks and tortoises get fresh water and I barely have to do any work to keep it clean. I'm pretty sure I can use the drained material as fertilizer around the yard. Plants/ground-cover: These I left up to Chris. We tried typical sod in the middle but the tortoise kept eating that instead of her food. Also the ducks made a mess everywhere. So we opted for pine-straws and lots of small shrubs. We planted Jasmine on the outside of the front fence and bunch of other flowering plants like Lily of the Nile. The planters will hopefully grow long enough to cover the back fence soon. We got the ducks last Christmas and I have spent the entire year getting this area setup just right. 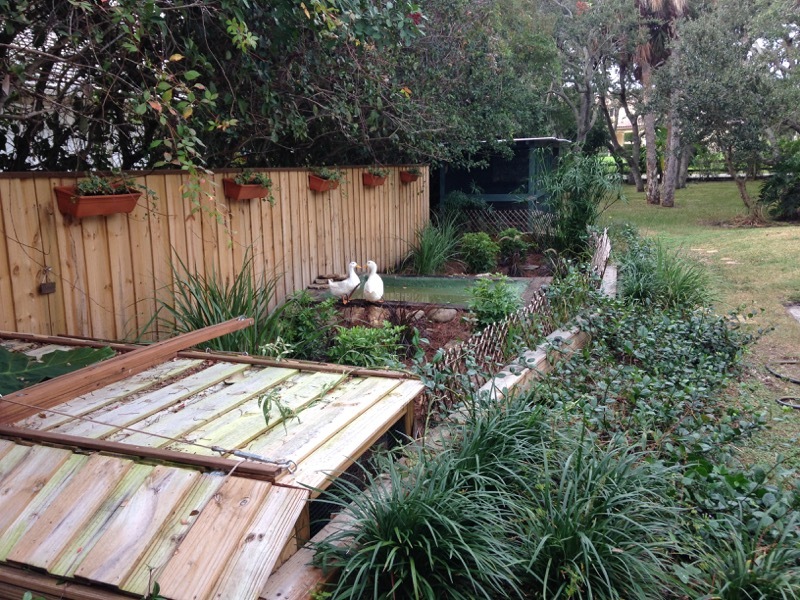 The ducks are SO happy and the tortoise is very active too. While I may not have done much work with my own hands, I came up with all the little solutions for each tiny problem and trust me there were many. We wanted our critters to live as close to their natural habitats as possible and I think we got it pretty close.